Your Avatar-Why did you chose it or what does it represent? I was going to use the first picture, put decided to go with something a little more "racy"
Mine comes from the Nordschleife. Our first visit in 2008 resulted in us taking pictures of the track and my favorite corner Wippermann 1 and 2. You can buy the paint to leave your mark on the track from the Official shop at the track and the Ardenau Official shop, and someone had decided to replace Yokohama with Yoko drama on the signs. I just felt it was a good way to remember the first visit, and the way people are allowed to paint at the track, and to remember the sweeping fast Wippermann corners. Last edited by Unkle; 11-02-2010 at 07:58 AM. SCA - Ski Club Arlberg is the oldest downhill ski club in the world. I've been a member for many years and I go skiing in the Arlberg as often as my bank balance allows - often getting there and back in my C4. Unkle, very interesting about the graffitti on the Nurburgring. I always assumed that it was done by vandals and had no idea you can buy the paint at the shop there to leave your mark. I must put that on list of things to do. My avatar was the best pic I had of my car at the time. It looks like it was taken in the rolling hills of the Yorkshire Dales or perhaps somewhere in Scotland. Truth is that it was taken about 2 minutes from my house standing on a bollard with the camera pointing down. Yeah go for it, I must add it to the list for 2011. My User name: Is a generic name I use in forums as I like the eclectic music from Unkle. They perform with everyone from Josh Homme and Ian Astbury to orchestra's in BMW ads...very weird. Hi Unkle, great shots from the RING, GOTTA go there soon, before I get too.... old. Definitely on My Bucket list. my screen name is a derivitive of prior forums. My favorite winged creature is a redtail hawk. When I rode mototcycles, I was ShadowHawk. when I got the Porsche, I modified to Hawk911. Mine was my other car of 3 years or so and I just loved the pic which was taken at Brands Hatch earlier this year. Avatar - back of my car, signed by some guy named Ferdinand Porsche. RSGulp - our team at Le Mans decided way beck in '97 that we needed a name and some team shirts. 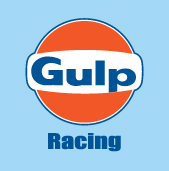 Team Gulp Racing was born after one or two beers and also we were there with Gulf Oil and supporting their McLaren GTR. Avatar- picture of my car parked on top of a mountain after chasing a group of super-boosted '80s Turbo (and a bright yellow Noble) for 100 miles through the mountains of North Carolina. After that drive I knew the 964 was one amazing car! 911Jetta - My first car was an '84 Jetta GL. Drove the wheels off of that thing. "Sorry Jetta I treated you so badly, you where my first and I had a lot to learn. "(still do!!) Fun, fun car when all my friends had Fords and Chevys. Old picture of me on an old car (yes, I stupidly sold an RS before prices went stratospheric). User name is a reference to my now departed best buddy, Bert, the three legged dog as fast as a rocket, RIP buddy.